Very happy that we chose this park for our stay in Branson! It was very easy to get to (be sure to follow the directions on their website, not GPS). We were able to arrive at our destination without having to deal with Branson traffic. The free trolley ran every 30 minutes through the campground. And Branson Landing and the Main Street River Boat are both within walking distance. We chose to drive and it was easy to get where ever we wanted to go. We had a "buddy site" at the campground with another couple - the space between was large. Our cement site was level and long (the cement was just long enough for the MH - gravel in front and behind). Some of the other sites did look small but still large enough for a MH. The dog park was nice. There is some noise from the trains but it did not bother us. I would definitely stay here again. And I almost forgot to mention how good the cable and WI-FI are! Highly suggest calling ahead for directions, as most GPS units will not get you there easily in an RV. We found these directions to work really well: Jct of Hwy 65 & Hwy 248 (Branson Landing Exit): Exit Branson Landing Blvd to circle, take 3rd exit, then stay in L lane (R lane ends) thru 3 traffic lights, then straight into park Note: Do not cross bridge & do not use GPS. The location is the best part of this campground. Easy to by-pass the traffic jams common to the Branson area. Excellent advice and tips provided by hosts in the office. Great access to Branson Landing and to sites such as School of the Ozarks, Top of the Rock, and the southern side of Table Rock Lake without ever having to deal with the heavy traffic in Branson proper or the "strip". What a gem. Super easy access from highway and walking distance to a bunch of cool stuff. Huge outdoor mall less than half mile away and accessible by a paved path. Huge Bass Pro there and a bunch of other cool shops, restaurants etc. The free Moonshine tasting place is a must! Bartender should have been on Comedy Central. All dog friendly and the zip line is pretty cool too! Right on the water...I can't say enough. If you are in Branson stay here. Called on my drive into Branson, the staff was wonderful about booking us a spot. They were super friendly. The camp host guided us to our premium pull through site , help us get setup and explained to us all about the park, area and even helped us get a rental car. This is one of the most perfectly located parks I have camped at . My 4 little boys loved the lake , the fishing . Branson is a must stay for any family. This is a great park, the location is excellent and they have a shuttle service to Branson Landing, to and from your door for a tip only. The sites have a concrete pad for your RV, grass and tables. 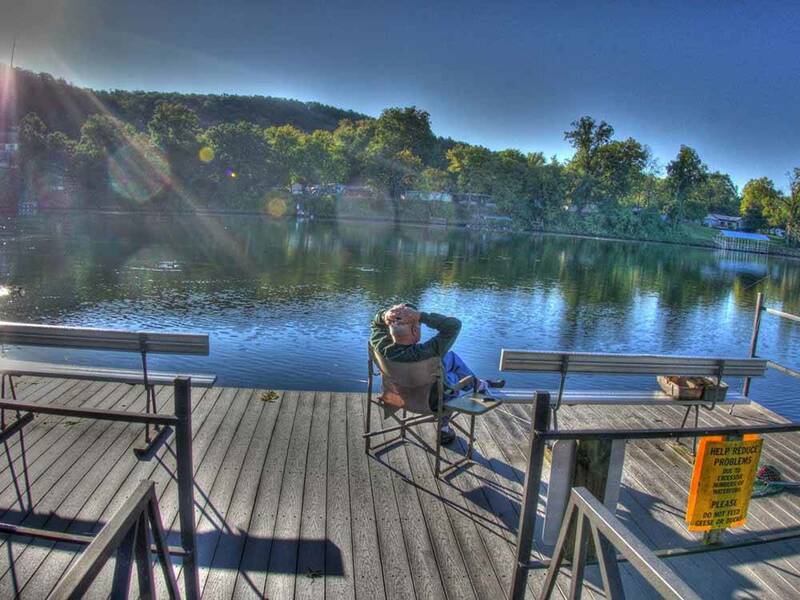 It is right on the lake with small docs to fish, feed the ducks, or just sit and relax. Half the park is shaded with trees and toward the water it is open with few trees, so when you reserve, ask for what you want. A lot of us have satellites now so no trees is perfect, and we put up with the heat when it is really hot, it is a give and take. When temp is a little cooler, these sunny spots are great being so close to the waters edge. The park is easy to maneuver around, I have a 45' 5th wheel pulled by a quad cab dulle and I had zero problems getting around and into my slot. The staff are really really super friendly. If you have a large rig, check this park out and not the other local one that is a couple blocks off the Branson strip. Love this location along with the little taxis that take you to the Branson Landing. There is a train that runs all hours, but it was not bad at all, I have heard maybe one whistle each day, you hear the rumble sometimes but it is really not that big a deal and it is not that often. Any of the Water Edge sites are great! We will pick this park over all the rest when in the area. The Wifi is the big problem here, so if you need it, this is not the park for you, it is horrible! it goes offline all day and night every few minutes it seems. We camped at Branson Lakeside RV Park in a Fifth Wheel. Overall a good place to stay with the exception that it is next to the railroad tracks and a very noisy train goes through at 3 in the morning. Also adjacent to 2 bridges which has considerable vehicle traffic and the expansion joints on the bridges and vehicle tires make considerable noise. Thank you for the review! We just made lots of updates so we hope to see you again in 2016! We love this park! This is an RV Park: not a campground. It is in the heart of Branson right on Lake Taneycomo, and convenient to many activities. The staff will do anything to make your stay enjoyable and will do it with a smile on their face. If you want to have fun, this is the place. The RV Park is managed by the City of Branson. It is located right off downtown next to the lake near Branson Landing. It was surprisingly quite for the area it is located. There is a trolley to the landing or you can walk. My wife and I stayed on the front row next to the lake. We both felt the pads were too close together. The Internet was fair (slow), Cable TV had a good selection. Restrooms are spick-and-span! This park is run by the City of Branson. It sits right off downtown next to the lake. We had an OK spot but there were better spots available. Traffic is real heavy during the summer while trying to get to the park. You can sneak out of the back of the park and go thru the residential areas to avoid some of the congestion. Internet was OK, Cable TV was good. Awesome visit, I stayed on the front row next to the lake. Enjoyed the rest and relaxation. I first thought the spots were too close together but in the end that wasn't an issue at all. We met some very nice fellow travelers and had a great time. Worth every penny. Visit and enjoy but make sure to get a premium spot on the water. Enjoyed this park! Restrooms are immaculate! Our space (#98) was on the water and we loved seeing the wildlife. Appreciate the cement pad and loved how close we were to the trolley stop for Branson Landing. We will return! Thank you! We appreciate your review! This winter we made all of our pads concrete as well as other improvements. We hope to see you again in 2016! All WITHIN OUR park & easy walking distance from YOUR RV - boat rentals, docks & marina will add to your relaxing stay at BRANSON's LAKESIDE RV PARK. Don't forget to pack your sunscreen & shades-our sunsets are spectacular! Jct of Hwy 65 & Hwy 248 (Branson Landing Exit): Go .2 mi E on Branson Landing Blvd to traffic circle, take 3rd exit, then continue 0.6 mi E thru 3 traffic lights (stay in L lane as R lane ends) then 0.1 mi E straight into park. Note: Do not cross bridge & do not use GPS.